Watching blockbuster CGI animated features is a good way to keep abreast of advances in digital effects — and philosophy. I can’t help noticing that each movie becomes more gravity-defying than the last, and with 3D, the characters come right at you. In titles such as How to Train Your Dragon, Kung Fu Panda and Madagascar and their sequels, people, animals, objects and cameras don’t just fly, they swing — in great arcs across the sky, bouncing, ricochetting and colliding, in jubilant arcs and sinusoidal sweeps. Alfred Hitchcock’s famous thriller Vertigo released in 1958 is more subdued. It opens with a chase across rooftops. A misjudged jump leaves the hero hanging from the guttering of a multi-storey building, while another policeman who tries to save him slips on the roof tiles and plummets to the ground. The hero is left suspended, hanging by his finger tips high above the ground. If only he had the dexterity of a Kung Fu Panda, he and the camera would be swinging their way to safety bounding across the rooftops into a CGI sunset. Hitchock never lets us in on the hero’s method of recovery. Swinging from a height permeates the vertiginous economy of the human condition. A drawing in the book Retorica Christiana, written by Didacus Valdes in 1579, shows a chain secured firmly by a hook into the clouds, with a weight at the bottom, traversed by a series of arcs that accommodate the ordering of angels, mortals and natural kinds connected at each level by the links of this single chain. Pendulums tell geometers about our position in the world. 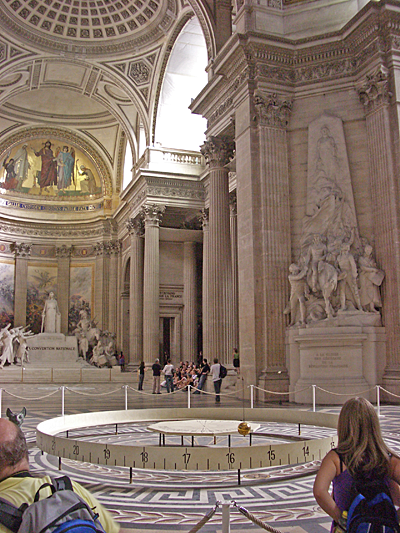 The long pendulum suspended from the ceiling of the repurposed chapel in the Musée des Arts et Métiers in Paris provides evidence of the rotary motion of the earth, as it swings slowly back and forth, returning to a slightly different position on each oscillation. Anthropologists identify the role of swings in rituals, the symbolic significance of which is all but lost in contemporary culture. Ritual swinging exists only in remnant form in marshall arts movie wire work, trapeze performances, CGI, and in the playground. Alfred Gell explains how in Central India Hindu divinities were sometimes depicted perched on swings suspended within ornate frame structures but like a contemporary child’s swing in scale and proportion. To be rocked in that way is apparently something of a privilege, like the rare honour of riding a horse or on the back of an elephant: “To swing, to ride, is to enjoy the vertiginous triumphs the Gods alone can know” (230). A cursory search of websites indicates that religious festivals of swings are still a major aspect of Indian cultural life. According to Gell, mediums whose job it was to channel the thoughts of the Gods would spend time imitating this action, sitting on the seats of wooden swings constructed for this ritual purpose. Gell relates swinging to the experience of vertiginous play, which in turn relates to the body’s equilibrium and disequilibrium and states of consciousness. Swinging is in the company of other vertiginous activities that seem to induce a state “combining fatigue, over-breathing and auditory stress” that “cause them to experience themselves and their situation in non-normal ways” (223). Excitement and this disorientation to the world around them seem to go together. Gell relates how such mesmeric swinging provides a feedback process as the participants attune themselves to the system of the world as a whole. So the motion of the swing, the rocking two and fro, has cultural significance, at least within some cultures. It also provides a means of escaping normal consciousness. In a ritual context it makes the medium dizzy and susceptible as a potential channel for messages from the Gods. Swings bring about both pleasure and danger, and take you out of yourself — a bit like sitting in a darkened room wearing 3D glasses and ducking pandas. Gell, Alfred. 1980. The gods at play: Vertigo and possession in Muria religion. Man, (15) 2, 219-248. Look up “swing art” on Google images. There’s also swing as a music and dance form. The online Urban Dictionary also gives some obvious meanings. Also see blog post: Heidegger and vertigo. Easing in and easing out: As every animator knows, when an object starts to move it speeds up at the start of its journey, and slows to a stop at the end. 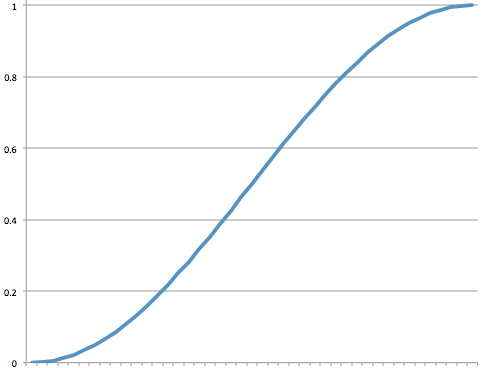 The smoothest path is achieved by the function d = ( 1 – cos( t ) * ∏ ) / 2, where d is the distance travelled (0-1) as a fraction of the total journey, and t is the elapsed time (0-1) as a fraction of the total time of the journey. This is how the speed of a pendulum varies across a single swing. Where else do things swing?